The family is back on the road again. 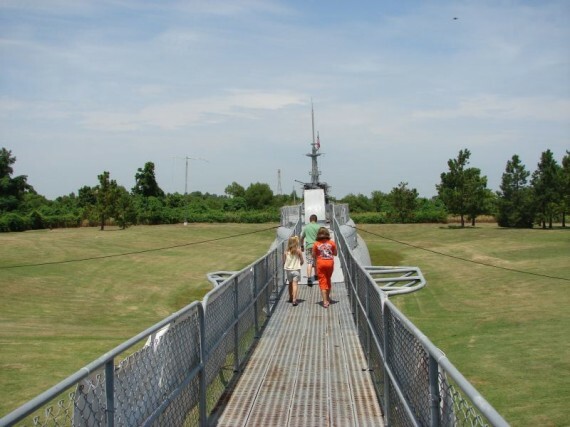 This trip will keep us in our own backyard, visiting some places in Oklahoma that we have not seen before, and allowing us to take the kids to some of our favorite places of years ago. We are traveling with my Mom & Dad (PK & KK), and my brother and his wife (Scott & Erin). This is our 3rd trip together as a family unit. 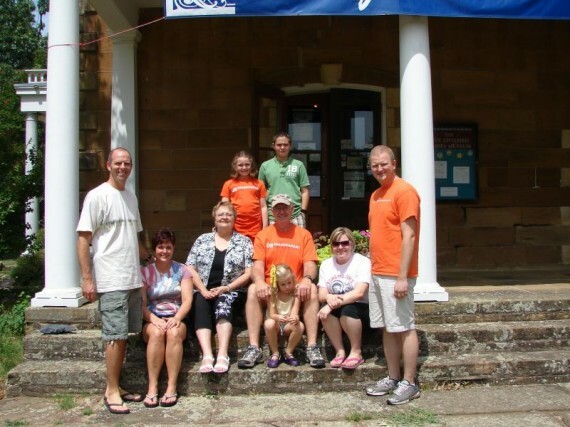 It is less than 45 minutes from Tulsa to Muskogee, which was the location of our first stop – the Five Civilized Tribes Museum. A visit to the Five Civilized Tribes Museum in Muskogee, OK.
As most people know, the Native Americans were displaced by our government in the 1800s to land west of the Mississippi River, Many of the Indians ended up in Indian Territory. Indian Territory later became Oklahoma Territory, and later the Great State of Oklahoma, in 1907. The Five Civilized Tribes (Cherokee, Creek, Chocktaw, Chickasaw, and Seminole) were very advanced groups of people, with democratic governments that rival what we have now. The museum is housed in a two-structure building that has a long history that has served many purposes over its years. The first floor is full of exhibits about the history of the tribes. We learned that Indians in the southeast United States bought slaves from the Europeans and were slave owners. Many slaves were brought to Indian Territory when they were displaced. Erin was able to request a book that contained the Dawes Rolls, and she found her great, great grandmother in there. She was required to wear white cotton gloves while looking through the book. That was a neat way to connect with our earlier generations. There was a neat display comparing the seal of the Cherokee Nation to the seal of the State of Oklahoma. They are very similar, and no doubt the state borrowed the features of the Indian seal when it was time to develop our own. After we had been in the museum about 20 minutes, Miles walked up to me and asked if we had $7,000 to spend on art. I told him “not today”. The 2nd floor of the museum was holding a competitive art exhibit. Miles had been checking it out and had found his favorite painting, which had a hefty price tag on it. We checked out all of the artwork, and most of us voted on our favorite pieces, then we hit the road. By this time it was about Noon, and we were ready to eat. Fortunately for us the museum is on the grounds of Honor Heights Park. This is a very large and green park, filled with trees and azaleas. The park hosts the Azalea Festival each spring. We have never been, but have heard it is beautiful..
We lucked out and found a shelter, which had just been hosed off, and was currently unoccupied. We had a great picnic, comprised of all-american things like sandwiches, potato salad, and cole slaw. There was a good sized party or reunion of sorts going on at the other end of the pond from where we were eating. Some folks down there hopped in a paddleboat shaped like a giant swan. They rode it down to our end of the pond, and this irritated the ducks near us to no end! They honked and carried on, and acted annoyed at this giant swan invading their space. The geese eventually gave in, and decided to swim after, and follow, the giant swan. 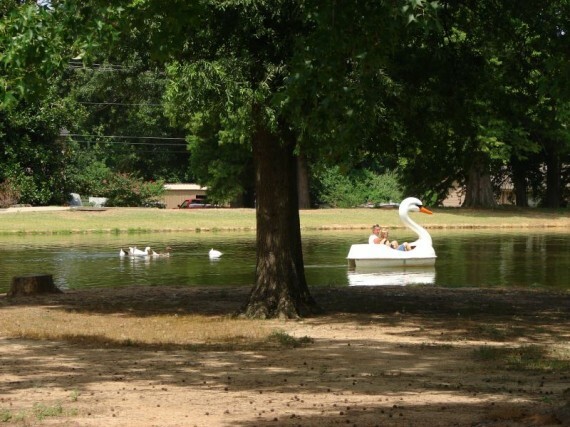 Giant Swan Paddleboat getting chased at Honor Heights Park. After lunch, we were off to our next step, the USS Batfish. The Batfish is a submarine that served in WWII, and has been on permanent display in Muskogee, Oklahoma, since the early 1970s. The Batfish is visible from the turnpike, and I have seen it as I drove by many times, but this was my first time to visit. Probably the most amazing thing I learned during this visit was that the Batfish was named after a real sea creature called… the batfish. It lives on the bottom of the ocean, and they even had one on display in the museum. 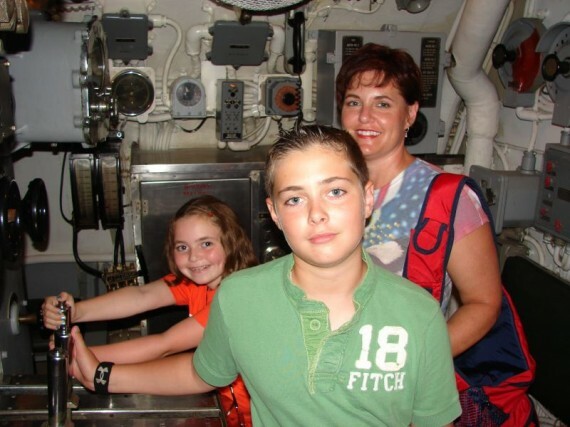 We were able to tour the submarine, which was very interesting. At 6’1, I suspect I may have been too tall to serve on a sub. The portals between portions of the sub were very small, and it took a real concerted effort on my part not to bang my head against the ship. 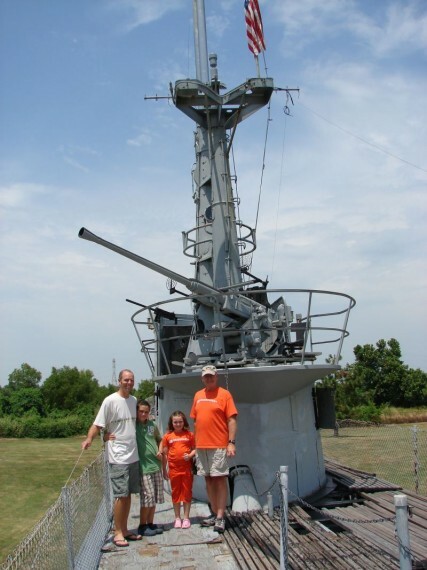 Kids walking onto the USS Batfish in Muskogee, OK.
Mallory, Stephanie, and Miles at the controls of the USS Batfish. Full Speed Ahead! The museum only offers self-guided tours, but we were fortunate enough to be following a group of Cub Scouts, which was being given a very interesting tour by a tour guide. It was wonderful to hear the stories of what happens when the sub is being stalked by destroyer and would begin to start dropping depth charges over the side. The tour guide did a great job of being dramatic and bringing the experience to life. The USS Batfish was not just any submarine; it was a highly decorated submarine. It sank 14 subs during WWII, including an astonishing 3 sub kills in 4 days! The Batfish was also the last non-nuclear submarine in use by the US Navy. By any measure, it has a great history, and I am disappointed that we had not made it a priority to visit before now. The attached museum had a nice collection of items related to the batfish, and WWII. There were many original newspapers, from V-Day and other important dates related to the war. There were also War Bonds, medals from various wars, including the Civil War, and a variety of other items. One Life magazine from the 40s had a picture of a military officer on the front, with the quote “Praise the Lord and Pass the Ammunition”. God Bless the USA!! 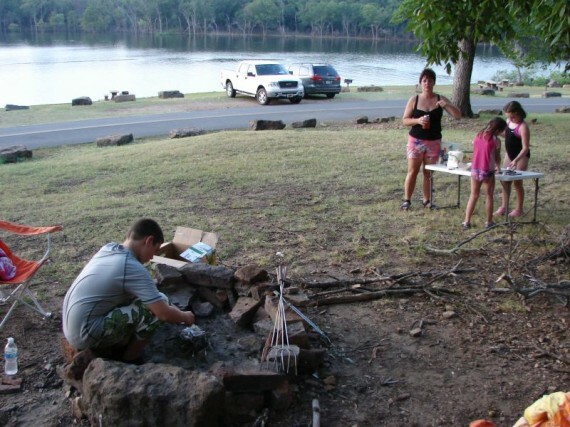 After the Batfish experience, we were off to our final destination of the day – Western Hills Guest Ranch, in Sequoyah State Park, located on Lake Fort Gibson. This is a state-run lodge that opened in 1956. It was very, very fancy in hits heyday, with its western motif, and it is still a fascinating place today. The resort is a combination of the lodge (hotel) and cabins. The lodge is configured so that it wraps around a central green space and very large keyhole-shaped pool. PK and KK’s room is on the first floor and opens out to the pool area. It is the official congregation area of our clan. After check-in, nearly all of us jumped into KK’s truck, with 3 of us in the cab and the rest riding in the bed. 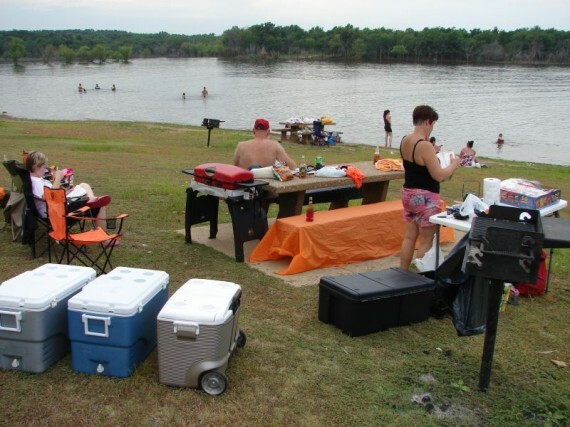 We were in search of a suitable beach area to do some swimming and grilling. We departed from the lodge and were on the road a minute when I asked if Marissa (age 6) was in the bed, as I could not see her. It turns out she was not! We thought she was in the back, and they thought she was in the front. We hustled back to the lodge, and found Marissa playing on KK & PK’s patio. Disaster had been averted! After we found the beach for us, we changed into our swimmies back at our rooms, and went back to the beach. The water was cool and comfortable, and if you could ignore the smell of fish, it was very enjoyable. We grilled out chicken on our grill-to-go, and enjoyed food and conversation for the duration of the afternoon and evening. At the end of the day, Miles put his Boy Scout skills to good use, and made us a great campfire that we used to make smores on. 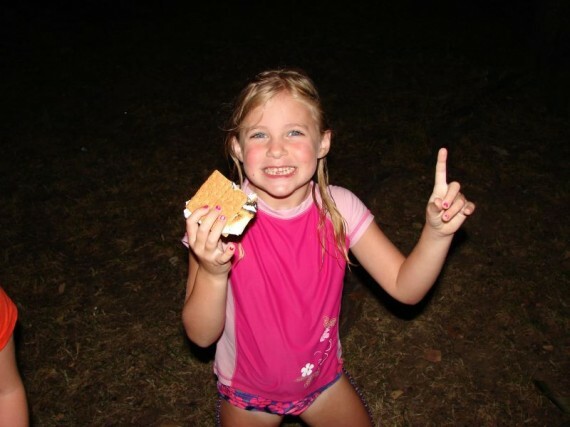 After we gorged ourselves on smores, we tended to the fire for a while, and then came back to the lodge. Miles creates the perfect campfire. The lodge scene was amazing. We arrived around 9:45. The lodge had hosted a round-up line dancing contest that evening, and it was just wrapping up. There must have been several hundred people both at the line dancing and at the pool. It was like stepping back in time. Old folks, young people, all shapes and sizes. Everybody was having a great time. Stephanie, Marissa and I went back to the room to clean up and head to bed. But Miles (age 11) and Mallory (age 9) stayed at PK and KK’s room and played a game of Phase 10, a popular card game, for a few hours. They finally wrapped up around Midnight, and came back to our room. However, they forgot Miles’ shoes, and they went back to their grandparent’s room to get them. Unfortunately, they forgot the room number they were staying in and were banging on the wrong room at Midnight! The old lady who they woke up was not very amused. Day 1 of our Oklahoma Road Trip has been a success.